The Confederation of Africa Football (CAF) yesterday imposed a life ban on a referee while six others and a technical instructor got 10 years ban for football related offences. 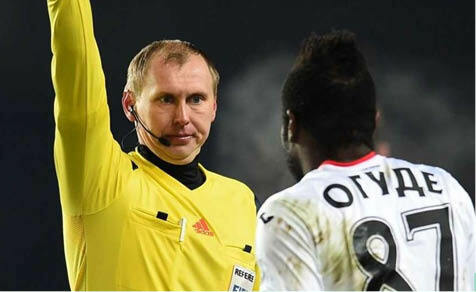 CAF announced on its website that David Laryea, Assistant Referee from Ghana, got life ban from all CAF related football activities following the Confederation’s recent Disciplinary Board meeting. Similarly, 14 other referees also bagged provisional suspension pending their appearance at the next Disciplinary Board meeting. The referees who got 10 years ban were Lathbridge Reginald, Nantierre Eric, Fleischer Cecil, Ouedraogo Dawood, Salifu Malik, Ms Akongyam Theresa and Wellington Joseph, a Technical Instructor all from Ghana. The referees with provisionally suspension were: Bello Aboudou, Referee (Benin) Baba Leno, Referee (Guinea), Aderito Marida Silva, Assistant Referee (Guinea Bissau), and Daouda Gueye, Referee (Senegal). Others were: Nkounkou Messie, Referee (Congo), Yamba Armand Gildas, Assistant Referee (Congo), Blaise Boutamba, Assistant Referee (Congo) and Hamada Nampiandraza, Referee (Madagascar). The rest were Kokolo Fitial Charel Just, Referee (Congo), Adii Prosper, Referee (Ghana) Isaka Ayensu Afful, Referee (Ghana), Anafo Nathan, Referee (Ghana), Badiu Ibrahim, Assistant Referee (Ghana) and Yekey Jerry, Referee (Liberia). CAF Disciplinary Board meets regularly to deliberate on cases of referees facing corruption allegations in CAF and federation matches. The referees were mentioned in the Anas Aremeyaw Anas documentary on corruption in Ghana and West Africa.